Just a quick Monday hello to show you the Shuffler children in all of their Halloween finery. 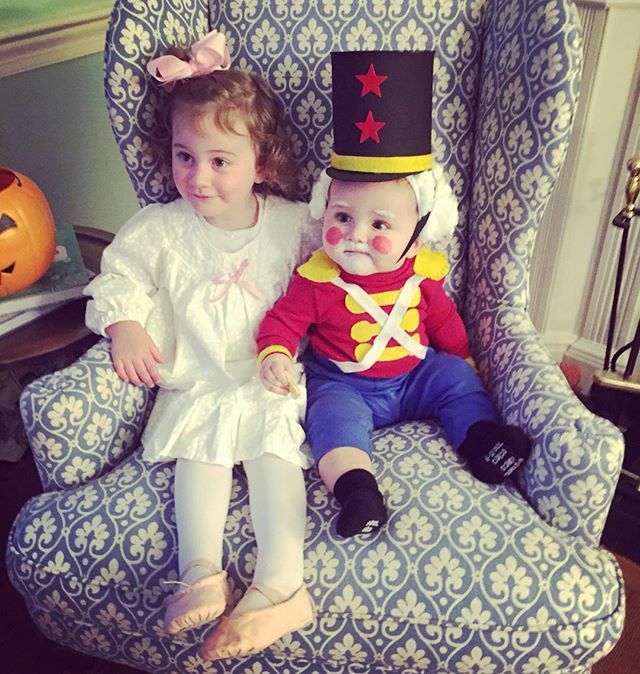 We opted to mix holidays and went with a Nutcracker Ballet theme - Ana Claire was Clara and Mac was her nutcracker. Ana Claire's eyes have been opened to the world of candy. And we can never go back. Your little ones are just too adorable, Danela. Love seeing them in their Halloween Finery!! oh they're so adorable! Glad you had a happy halloween! Big laugh on Ana Claire's discovery. But I've just heard about the Switch Witch from a new generation Mom out on the West Coast - is this happening on the East Coast also? Karen, I have not heard of this! Though AC would likely despise her...we tried to do something similar with a "big bed fairy" who was going to switch her crib for a bed with treats and presents and she wasn't having it.